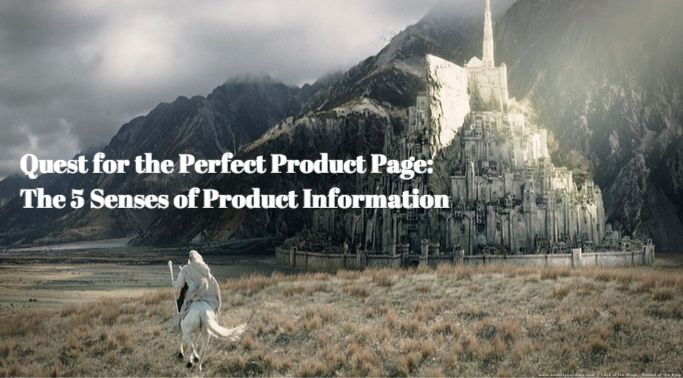 Editor's Note: This is the third installment of our "Quest for the Perfect Product Page" series. Once you've figured out your keywords and established your voice, it's time to think about what product information shoppers need to feel comfortable making their purchase without seeing the product in person. This requires providing the assets they need to replace the tactile benefits of seeing something in a store, so its only logical to use the 5 senses as our guide. Providing a high volume of diverse images is a crucial way to provide shoppers with the confidence to purchase products. Imagine that you are shopping in a store and see a beautiful necklace in a glass case and a sales associate informs you that you can't touch the necklace or try it on before purchasing. It's highly unlikely that you'd commit to the purchase; in fact you might even be suspicious that the necklace was defective in some way. Offering shoppers only one or two pictures of a product is the ecommerce equivalent of keeping that necklace in a glass case. which is why it's important to provide images from multiple angles in order to replicate the in-store experience. Rebecca Minkoff has become a household name familiar to fashionists everywhere since designing her first handbag, titled the “Morning After Tote” in 2005. Her handbags are carried in nearly every major retail outlet. from major departments stores like Bloomingdale's, Nordstrom, and Neiman Marcus to heavy hitting online retailers like Shopbop and Zappos. 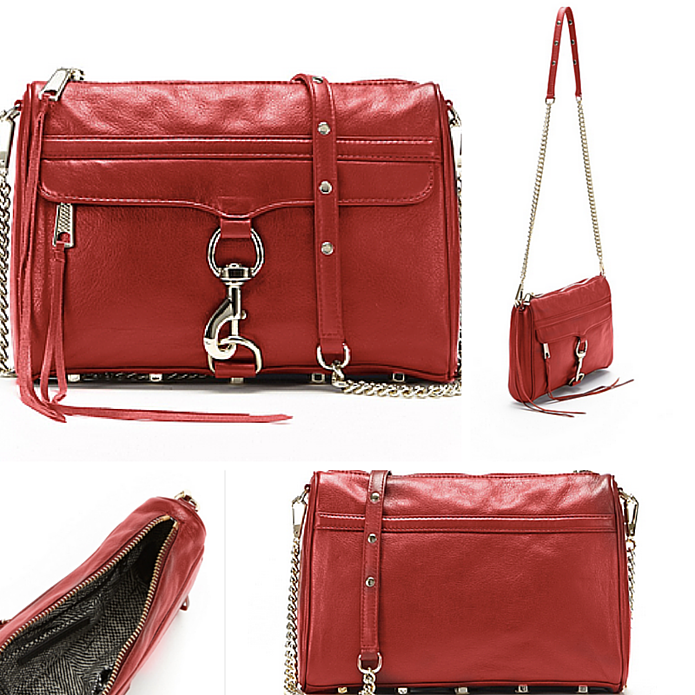 Rebecca Minkoff bags are beautiful in person, but more importantly, each bag is beautifully photographed from multiple angles, including the inside, to ensure that online shoppers can get a thorough understanding of what the bag looks like in person. A lot of brands underestimate the importance of communicating how a product feels to online shoppers. There are a lot of different ways to do this: including the materials products are made of is certainly a good first step, but there are a lot of other important ways to ensure shoppers understand exactly what they're getting before they commit to a purchase. For example, simply informing shoppers that a sweater is a “cotton-poly blend” doesn't really communicate how this sweater would feel. Is it very soft? Does it breathe well, meaning it is a good option for layering, or is it a heavy knit that's especially warm? Whatever the sweater feels like, its important to make sure shoppers have a good sense of what they're going to receive once they hit that “buy” button. 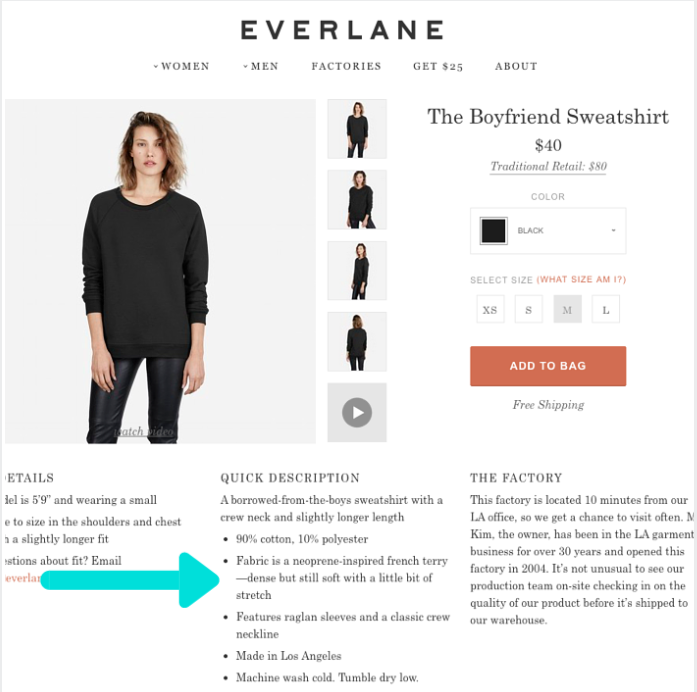 Everlane quickly gained notoriety as one of the first “direct to consumer” ecommerce brands, but without their skillful product descriptions it would be difficult to convince first time shoppers to buy products they've never seen in person. When it comes to smell, its important thing to remember that it's not always enough to explain the separate components involved; figure out descriptive terms that will express the relevant emotion these components evoke. Illume is 20-year-old fragrance brand based in Minnesota that's carried at International retailers like Target and Anthropologie. 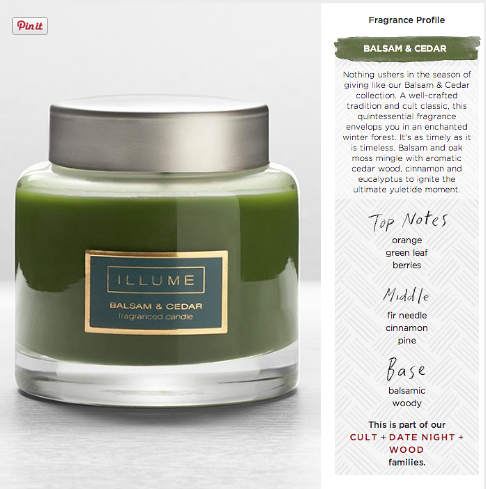 Illume's candles smell fantastic, and they have mastered creating content that weaves a story and associates a specific idea or emotion with each scent. Edible products can be a tough sale, especially online, but when done correctly using taste to appeal to consumers can be a highly effective way to influence conversion: it's a rare shopper who can resist the temptation of deliciousness. Similar to smell, it's not enough to simply list the flavors found within a product: make the product come alive on the page by including an abundance of flavorful (pun intended) adjectives. Lake Champlain Chocolates has been creating delectable chocolates at their Factory in Burlington, Vermont since 1983 and can be found at many high-end specialty food stores, including Whole Foods stores nation-wide. 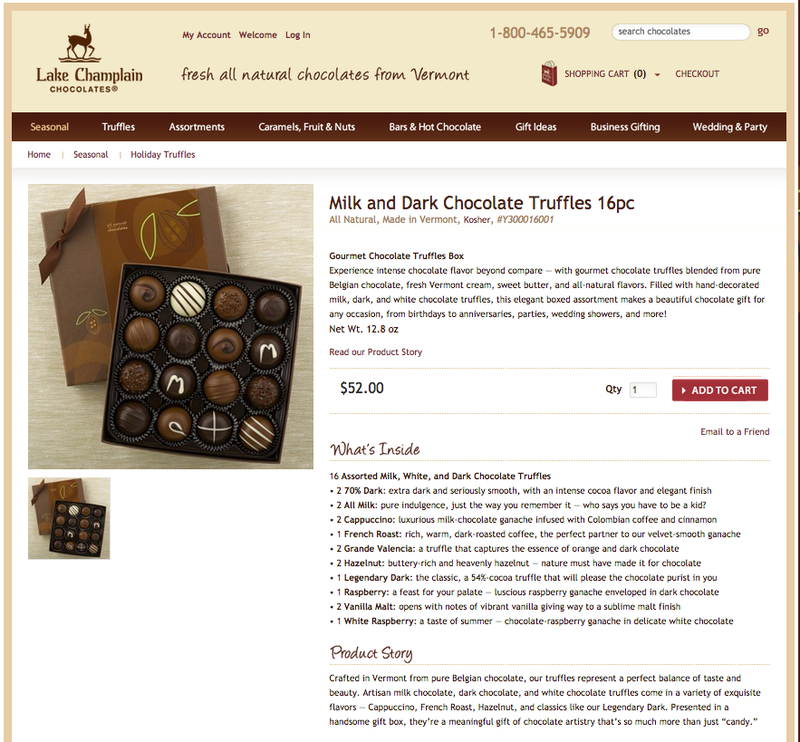 In addition to their wholesale business (and their popular factory tour) Lake Champlain Chocolates has cultivated a profitable ecommerce site to sell their wares across the country. One look at their website's decadent descriptions makes it clear why shoppers are willing to purchase chocolates online without the benefit of a taste test. Sound, like smell and taste, may not apply to every product category, but it's an equally important facet of the product description when applicable. Avoid using marketing terms like “unparalleled” or “superior” to describe the quality of sound - those are placeholders that don't offer any type of measurable excellence. Another thing to avoid? Brand-specific terminology that's only relevant during internal comparisons. Instead, take the time to figure out how to communicate your products' value in a way that anyone can understand, whether they're an expert or a novice, familiar with your brand or visiting your website for the first time. 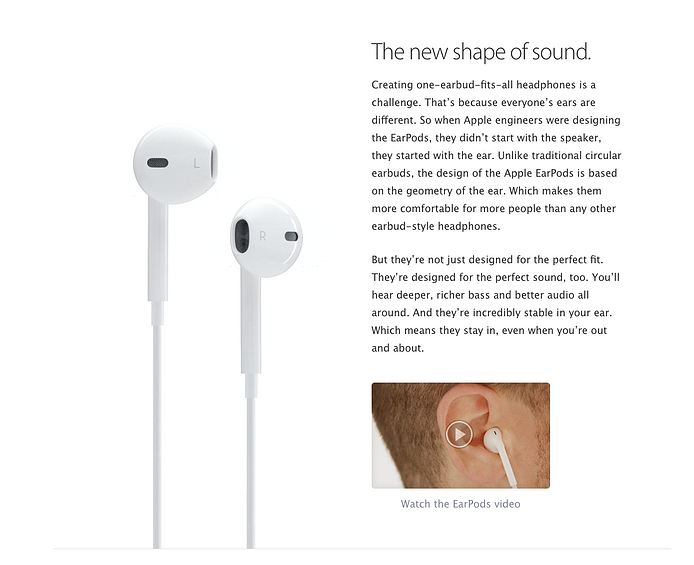 Is there any company that has cultivated a more appealing brand than Apple? Stunning visuals are important yes, but it's equally crucial to note the approachable and universal language used within product descriptions. Despite maintaining a reputation as one of the most well-known (and expensive) tech brands, Apple has managed to be a brand that's just as appealing to your gadget-obsessed 16-year-old cousin as it is to your technically challenged Great Aunt. Its not always easy to replicate the tactile experience of in-store shopping online, but well-rounded, informative product information is crucial to empowering your customers to make a purchase decision. Don't hesitate to go above and beyond the "standard" product information requirements; you'll be amazed at how quickly your audience (and your conversion rates) expand. Need Inspiration? Subscribe to the Salsify Blog and receive our printable 5 Senses Thesaurus.